Four leading security manufacturers have teamed up to provide safety and security solutions for the players, coaches and fans at the 71st Annual Little League Baseball Series (LLBS). For the first time, Milestone Systems is joining Axis Communications, Extreme Networks and Lenel to provide video surveillance systems, access control and network connectivity for the 10-day tournament. A fully integrated security system is in place as 16 Little League Baseball teams and hundreds of thousands of fans came together in South Williamsport. A priority of Little League Baseball officials is promoting a fun, exciting experience, while also providing the highest level of security. "Our town of 6500 people booms to almost half a million over the course of this annual event. Making sure it is both fun for families, and safe for all who take part, is of utmost importance. We have every confidence in Axis Communications, Extreme Networks, Lenel and Milestone to help us achieve these goals. They are tested and proven systems, with each of these companies’ leaders in their field, chosen to protect the players and fans from around the world," said Jim Ferguson, assistant director of risk management for the Little League Baseball Series. Axis Communications is supporting the Little League Baseball World Series for its eighth consecutive year and continues to build on the security programme it helped establish during previous events. New technologies deployed this year include the AXIS Q1659 network camera, which is the first to combine professional-calibre photographic imaging technologies from Canon to deliver ultra-high image quality for fixed, wide-area surveillance and detail, even in the most challenging lighting conditions. The new AXIS D2050-VE Network Radar Detector is deployed as an outdoor motion detector for accurate and reliable perimeter protection, day and night, to minimise potential false alarms. 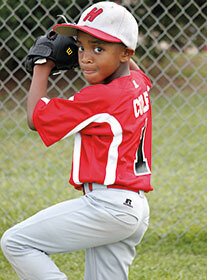 The new AXIS People Counter video analytics solution helps the Little League gain operational insights. Upon arrival, each player, staff member, volunteer and vendor is enrolled in Lenel’s OnGuard system and receives a photo identification badge for use during the series. These personalised badges allow entry to selected areas of the facility. Only players and authorised staff are allowed access to the dormitory areas where players sleep, eat and rest. Added to the Little League 2017 technology team is Milestone Systems, providing XProtect IP video management software. In addition to central management of all cameras and users, the XProtect Smart Wall gives operators total situational awareness of activities. The software supports failover recording servers, for just such mission-critical installations that require continued access to uninterrupted video coverage. Also introduced in the video management solution for this year’s event is an advanced Milestone Husky Network Video Recorder (NVR), for additional network and video analytics support. Custom installed with XProtect Corporate VMS, the Milestone Husky 500A is an accelerated performance NVR that leads the industry in recording rates, low power consumption, and system flexibility – including support for unlimited storage.